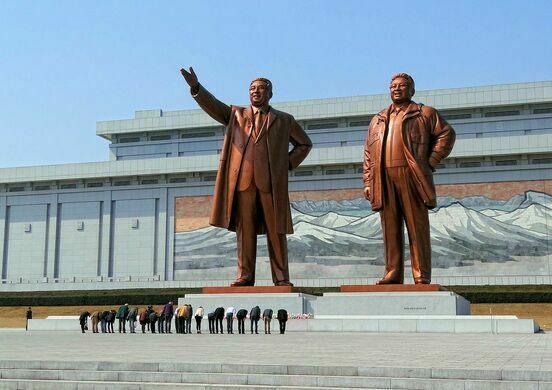 On Mansu Hill in North Korea’s capital city, Kim Il-sung and Kim Jong-il stand a staggering 20 meters of bronze. This memorial monument allows the Great Leaders—who are immortal in the eyes of the people—to be remembered forever. It is one of the most sacred places in the DPRK. As such, visitors are expected to show the correct visiting etiquette—purchasing flowers to lay at the giant statues’ feet, marching in solemn line, hand by your sides and bowing. Photographs of just part of the monument are forbidden and considered insulting; photos must be framed to include the entire monument. 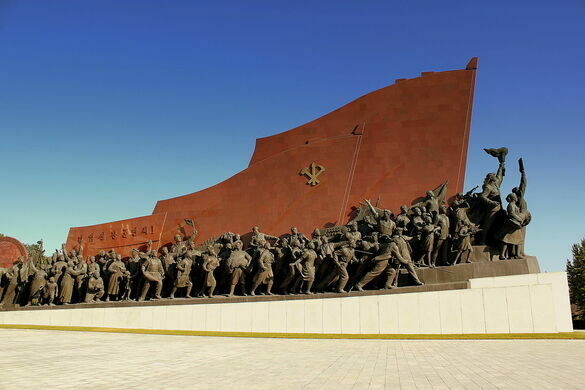 Kim Il-sung—the one with his arm outstretched away from the 70-meter-wide mosaic of Mount Paektu— was the original monument, unveiled in 1972 to celebrate the leader’s 60th birthday. (Reportedly the statue was originally covered in gold leaf, but was changed to the less expensive bronze at the insistence of China.) After his death, the leader’s son, Kim Jong-il joined him in bronze. One of the largest public squares in the world, named after the former DPRK supreme leader.